For many people, dandelions are simply a yard pest; a pesky weed. However, dandelions are very rich in nutrients. 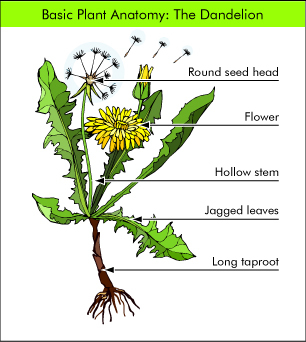 For herbalists though the dandelion is a valuable herb with many culinary and medicinal uses. The bitter dandelion root is a favorite in folk medicine, and particularly useful for stimulating a sluggish liver. The dandelion is a rich source of vitamins A, B complex, C, and D, as well as minerals such as iron, potassium, and zinc. The most active ingredient in dandelions, eudesmanolide and germacranolide, are found only in dandelions. They also have high levels of minerals like iron, magnesium, zinc potassium, manganese, copper, choline, calcium, boron, and silicon. Native Americans have used dandelion decoctions (liquid made by boiling down the herb in water) to treat kidney disease, swelling, skin problems, heartburn, and stomach upset. Chinese medicinal practitioners traditionally used dandelion to treat digestive disorders, appendicitis, and breast problems (such as inflammation or lack of milk flow). In Europe, herbalists incorporated it into remedies for fever, boils, eye problems, diabetes, and diarrhea. Many herbal doctors use dandelion to purify the liver and gallbladder of toxins. Research has indicated that dandelions can treat pneumonia, bronchitis and other respiratory disorders. The dandelion has shown to improve general health and is also beneficial to the kidneys, pancreas, spleen, stomach and other organs. It has also been recommended for the treatment of tinnitus, tonsillitis, osteoporosis, abscesses, anemia, boils, mammary tumors, cirrhosis, water retention, hepatitis, jaundice, rheumatism and warts. Along with all these uses, the root of the dandelion can be used as an alternative to coffee (see recipe below) for which it is believed to have a tonic effect on the pancreas, spleen and female organs, while the leaves are wonderful in salads, sandwiches and teas. So what we have thought of as such a pesky, horrible weed has now turned out to be a most beneficial herb and herbal medicine. Dried leaf infusion: 1 - 2 teaspoonfuls, 3 times daily. Pour hot water onto dried leaf and steep for 5 - 10 minutes. Drink as directed. Dried root decoction: 1/2 - 2 teaspoonfuls, 3 times daily. Place root into boiling water for 5 - 10 minutes. Strain and drink as directed. Although dandelion is a wonderful plant it does not always grow where it is wanted. When weeding, keep the long taproots. Scrub all the dirt off the roots, chop into pieces, and roast in a medium oven until dry and slightly burnt. Make a decoction and take 1 or 2 cups a day as a liver strengthener and tonic. Please consult your physician or other qualified health professional before taking supplements of any kind. I enjoyed your blog about dandelions. I share a love of herbs as well. I also see dandelions as you do-as a health benefit and not a weed. I had dandelion leaves in my salads this summer. Yum! !